Bow hunting hogs in Texas is a year round sport with more and more hunters switching from traditional rifles to the challenge of a bow. Bow hunting requires more accuracy for a kill shot and it also means you have to improve your overall stalking skills so you can get closer to the hogs. This all leads to a very dramatic hunt that will ensure great hunting stories to tell for years to come. One of the major challenges to bow hunting hogs in Texas or any other state is that they can be very difficult to bring down with a single shot or even multiple shots. Even with a high powered rifle it can be a real challenge, so bow hunters have to be extremely precise with their aim and accuracy. This often means waiting patiently for a hog to turn and present a good shot, ideally through the lungs or heart for a kill shot. Patience is certainly a virtue when it comes to bow hunting feral hogs. Bow hunting hogs in Texas can be done year round. Many areas of the state encourage any type of hog hunting since the hogs have become so numerous and they are considered to be both dangerous as well as a huge nuisance to farmers, ranchers and even drivers. 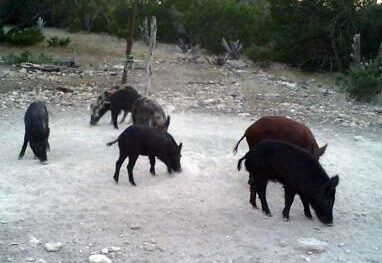 According to a report by Texas Parks and Wildlife Department that there are between one and a half and two million feral hogs across the state. They reproduce at alarming numbers with most sows over six months producing up to two litters a year with an average of four to six young per litter. The ratio of male to females born in each litter is one to one. There is never a shortage of breeding adults. Feral sows tend to travel with their litters in a single group of two or more family units, which is known as a sounder. The boars travel alone except for during the breeding season. A large male boar can easily weigh in at two hundred to two hundred fifty pounds with sows just a bit lighter at an average weight of one hundred thirty pounds. Hunters in the state have bagged numerous four hundred plus pound hogs. 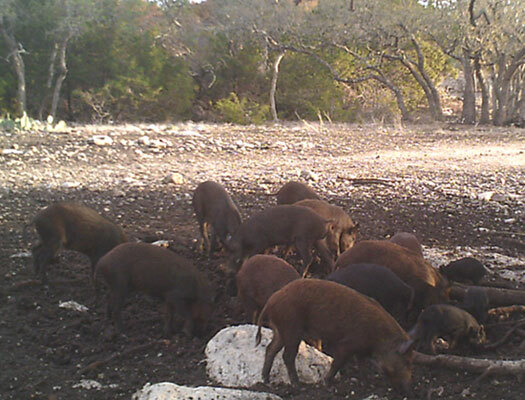 Baiting and trapping is another option for hunting hogs in the Texas, but nothing compares to the excitement of taking one down with a stick and a string.